Small in size, but not compromising on airflow, this Xpower mini air scrubber can be purchased in two different configurations. The X-2380 commercial air purifier is ideal for groomers seeking a healthier working environment. It features a highly effective 3-stage filtration system that can clean areas up to 1,500 ft². 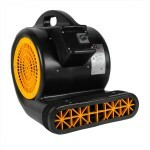 The second configuration is the X-2580 4-stage HEPA filtered model, which is ideal for flood restoration professionals. Both units draw 2.8 amps, and have a max efficiency airflow capacity of 550 CFM. Simply turn on the X-2380 unit to clean the air of harmful airborne contaminants such as hair, dander, pet allergens, mold, and bacteria. Groomers and customers alike will enjoy a fresh, clean space that is free of harmful pollutants that can contribute to and aggravate conditions such as asthma, allergies, sinus congestion/pressure, and other respiratory conditions. The X-2380 offers the ultimate in efficiency and affordability. All 3 stages of filtration are washable and reusable — saving you from costly filter replacements. Two outer nylon mesh pre-filters effectively capture 90% of medium to large contaminants such as fur and dander. The final stage HEPA filter removes 99.97% of 0.3-micron sized particulates as well as other particulate sizes including bacteria, allergens, and sub-micron sized dust. The optional 4 stage commercial grade option include an additional carbon filtration step for effective odor control, effectively absorbing and neutralizing a wide range of odors and other pollutants. A convenient indicator light reminds you when it’s time to clean inner filters. Both models contain the same powerful commercial grade motor that circulates and ventilates fresh, clean, purified air throughout your space. The X-2580’s five speed control switch gives you the flexibility to run the unit on a quiet low speed in noise sensitive environments. A lipped air outlet can be easily ducted to channel purified air or create negative air pressure. Stackable and lightweight for easy transport, the rugged Xpower X-2580 mini air scrubber is ideal for even the toughest water damage restoration and construction jobs. This is a review for the Xpower Pro Clean X-2380 3-Stage Mini Air Scrubber (w/ X-2580 4-Stage HEPA as an option).